The Mother PAC | We’re voting for Kate Brown. Here’s why. We’re voting for Kate Brown. Here’s why. With less than two weeks to go until ballots are due (November 6th! ), we’re working hard to make sure that every candidate endorsed by The Mother PAC wins their race. 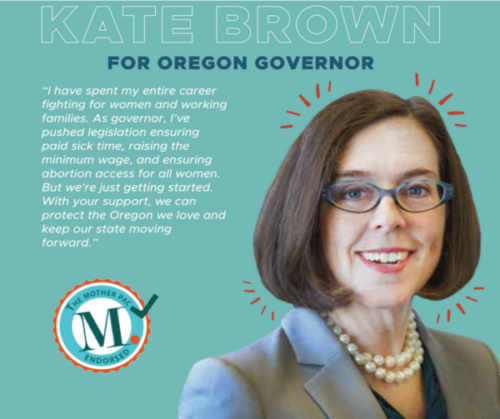 That’s why in the next few days, we’ll be sharing some of the top reasons we’ve endorsed these candidates — starting with Governor Kate Brown! Not only is Governor Brown one of only a handful of woman governors in the entire country, but she’s one of only 2 democratic women governors in the WHOLE COUNTRY — and that’s a huge deal. Kate Brown is, hands down, the best choice to be Oregon’s next governor. A fierce advocate for reproductive justice (who recently expanded reproductive health care throughout the state), she is the only true pro-choice candidate. And, unafraid to take a stand against Trump’s anti-immigrant policies or against the anti-immigrant Measure 105, she’s the only candidate we can trust to make sure Oregon is safe and welcoming for communities of color. Under her leadership, Oregon has passed some progressive policies to help protect mothers and families, like increasing the minimum wage and ensuring all workers can earn and take paid sick days when they need them. But most importantly, Governor Brown knows that the work isn’t done yet. If we want to chip away at the gender wage and wealth gap, or level the playing field for moms of color, then we need to make things like paid family and medical leave and affordable, high-quality care for families a reality. Kate Brown supports these things. And that’s why we’re on #TeamKate. Join us in voting for Kate Brown for Governor, so we can build real mama power in Oregon. PREVIOUS POST: « Enter to Win!